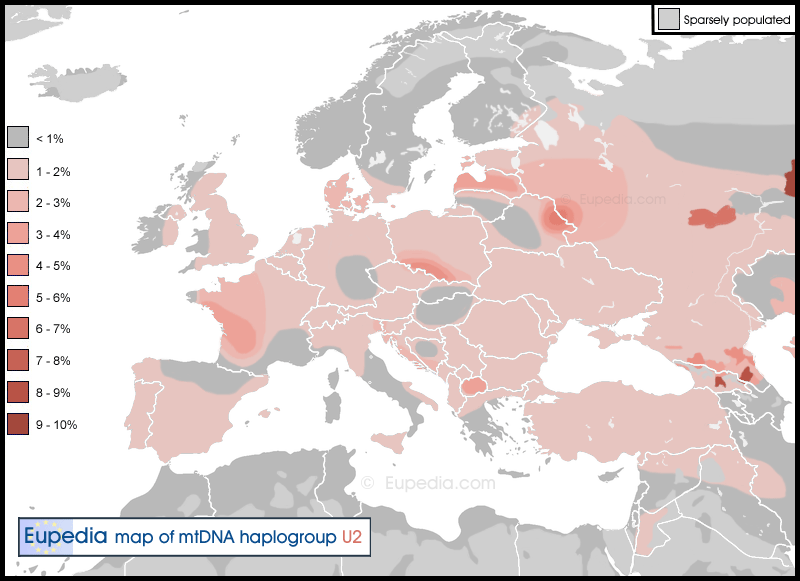 Haplogroup U2 is rare lineage very homogeneously spread across most of Central Asia, Europe, the Middle East and North Africa, with a frequency typically ranging from 0.5% to 2%. Only a few isolated ethnic groups, mostly in the Volga-Ural and North Caucasus regions, have frequencies above 3%. This includes the Uralic-speaking Udmurts (10%) and Mordvins (7%), as well as the Karachay-Balkars (4.5%), Nogays (3.8%), North Ossetians (3.6%), Adyghe-Kabardin (3.6%) and Dargins (3.6%) in the North Caucasus, and the Latvians (3.5%) in the East Baltic. The only region where U2 is constantly found in higher frequencies is South Asia, where it is found found in roughly 6.5% of Bangladeshi people, 12% of Sri Lankans, and at an average frequency of 5.5% of in India, especially among Indo-Euopean speakers (7.5%) and with local peaks in northern India exceeding 20% (source: Mestpalu et al. 2004). However, South Asian subclades of U2, namely U2a, U2b and U2c, differ from the Central Asian U2d and European U2e. Only a few ethnic groups in Europe appear to completely lack haplogroup U2, although this could be due to sampling bias. So far, U2 has not been found among Ashkenazi Jews, Cypriots, Sardinians, Welsh, Icelandic, Saami, Lithuanians, Avars and Chuvash people. Haplogroup U2 is an extremely old lineage, going back at least 40,000 years, when Homo sapiens first expanded from the Middle East into South Asia and Central Asia, and before they even set foot in Europe. Two of the oldest Homo sapiens DNA samples from Europe tested to date, a 37,000 and a 33,000-year old Cro-Magnons from the Kostenki site on the Don River in the Russia, both belonged to haplogroup U2 (see Krause et al. 2010 and Fu et al. 2016). Their paternal lineages were indentified as Y-haplogroups C1b and CT, two Paleolithic lineages that are now believed to be extinct in Europe. Y-haplogroup C was the first to leave Africa and colonise Eurasia 70,000 years ago. C1b still exists today in the Arabian peninsula, in India and in Polynesia (Hawaii, Micronesia, New Zealand). The extremely wide dispersal of Y-DNA haplogroup C and mtDNA haplogroup U2 attest to their antiquity. More U2 samples were identified among other Paleolithic and Mesolithic European hunter-gatherers, including four Gravettian U2* individuals from Goyet Cave in Belgium dating from 22,000 to 24,000 years ago (Posht et al. 2016), a 11,000 year-old U2e from Blätterhöhle in Germany (Bollongino et al. 2013), two 9,500 year-old U2e individuals from Karelia in Russia (Der Sarkissian 2011), and two 8,000 year-old U2e1 individuals from Motala in Sweden (Lazaridis et al. 2014). Based on these ancient DNA results from Europe and the presence of all basal subclades of U2 in Central Asia, it is likely that U2 people roamed between Central Europe and Central Asia during the Paleolithic and Mesolithic, and perhaps already in other parts of Europe and in South Asia. The steppes of eastern Europe and Central Asia are probably the original geographic location from which such a dispersal was made possible during the Stone Age, and again during the Bronze Age. U2 became much scarcer among European Neolithic samples, only popping up once in an early Linear Pottery sample from Hungary. In the late Copper and early Bronze ages, U2 made a come back among Proto-Indo-Europeans cultures. U2 samples were found in the Yamna culture (U2e1a), Corded Ware culture (U2e1 and U2e2), Unetice culture (U2e1f), as well as the Andronovo culture (U2e) in Central Asia. Proto-Indo-European speakers from eastern Europe had a higher proportion of Mesolithic European ancestry than Neolithic farmers, so it isn't surprising to find a slightly higher frequency of U2e among samples from that period. U2e actually shows up with surprising regularity in ancient samples from Ukraine and European Russia. For example it was also found in Iron Age Scythian remains from Rostov-on-Don in southern Russia. U2e even showed up in Indo-European bones from the Tarim basin in north-west China, also dating from the Iron Age (possibly Scythian or Tocharian), but also at a Xiongnu (Hunnic) site from the same period in Mongolia. U2e : found in most of Europe and Central Asia / found in Mesolithic Germany and Russia, in Chalcolithic Russia, in the Andronovo culture, among the Scythians and in Iron Age Scandinavia and England. The T16189C polymorphism, defining haplogroups U2d and U2e, lowers the rate of mtDNA replication and consequently the number of mtDNA copies, reducing metabolic efficiency. It has been linked to maternally inherited thinness (Parker 2005), thinness at birth (Soini 2012) and increased body mass index (Liou 2007), and increased frequency of type 2 diabetes in the UK (Poulton 2002) and in Asia (Weng 2005 and Park 2008). Hendrickson et al. (2008) studied the role played by mitochondrial function in AIDS progression in HIV-1 infected persons. They found that AIDS progression was slower for members of haplogroups H3, I, K, U, W and X.